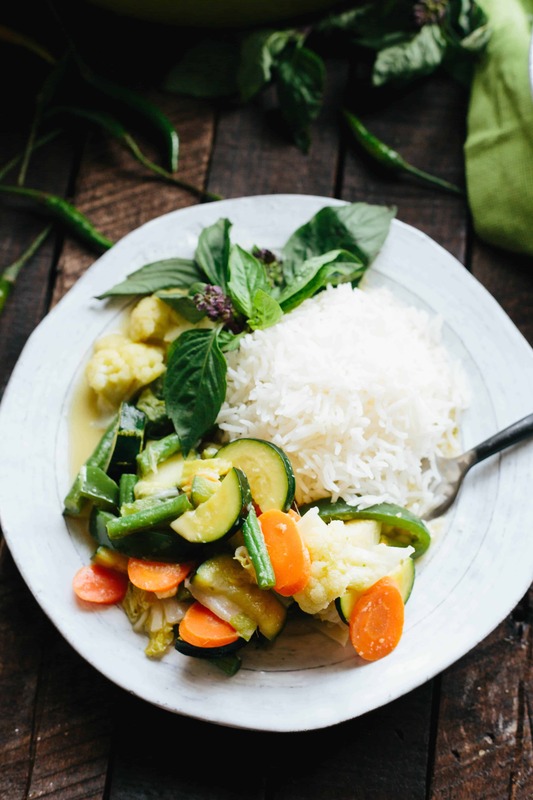 This authentic recipe for Thai Green Curry is made with a from-scratch Thai green curry paste and includes a detailed tutorial on how to use your favorite vegetables and proteins to create easy, delicious and healthy homemade meals. Thai green curry, or Gang Kiew-Wan, is my favorite kind of curry. Growing up, curry was a four letter word in my house. My mother wasn’t into heavily spiced foods, and she especially hated the flavor of curry. So many people, like my mom, associate the word “curry” with the typical turmeric-based spice blend that can be purchased at any regular grocery store. It’s the one people added to chicken salad in the 80’s and used as a “secret ingredient” in sauces and casseroles. I like it, but it’s a polarizing flavor. What so many people fail to realize is that this is just one type of curry, a dumbed down, generic version that’s usually mass produced with an unbalanced blend of spices and a stale flavor from sitting on the shelf for too long. The word “curry” simply refers to a blend of spices and aromatics, and there are hundreds, maybe even thousands, of different types of curry in the world, all with widely varying flavor profiles. 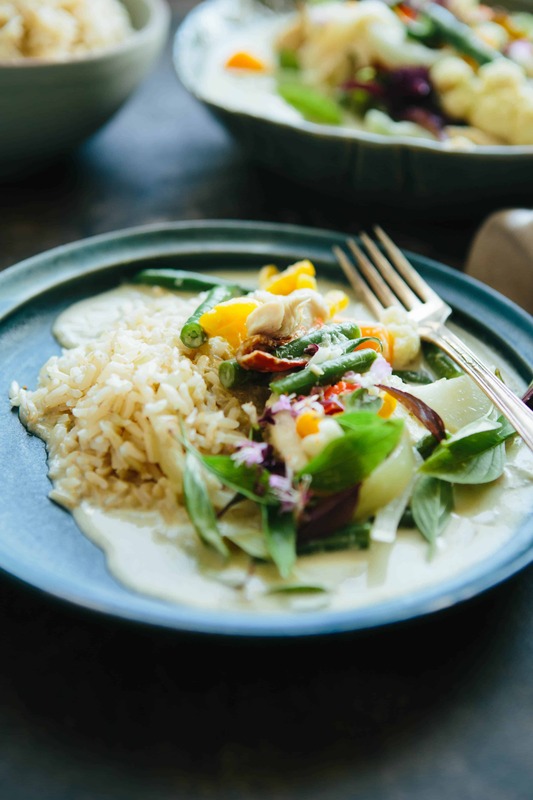 Thai curries for instance, are typically made from a paste – like this Thai Green Curry Paste – that includes fresh aromatics like chiles, shallots, garlic, ginger, and lemongrass, along with different dried spices. They’re often simmered with coconut milk and tend to have an exotic, almost tropical flavor. I say this as a generalization, as I’m by no means an expert, and there are certainly many exceptions to the rule. This Thai green curry paste, however, is just what I’m talking about. Just like I did in my post about Dan Dan Noodles, It’s important for me to point out that I’m not Thai, I’ve never been to Thailand, I personally know only a handful of Thai people, and there are only a few Thai restaurants around here (and none of them are really all that great). But I can say that Thai green curry has been one of my favorite meals ever since I tried it as a teenager. I first attempted to make a Thai green curry paste myself about 1o years ago, and while it wasn’t terrible, it wasn’t really good either. I’ve taken a lot of time since then to research, test, and perfect this recipe to get it exactly where I want it, and I’m really excited to finally share it. The following post will be a bit lengthy, as I feel it’s necessary in order to teach you everything I’ve learned along the way. So buckle up and get ready to read. 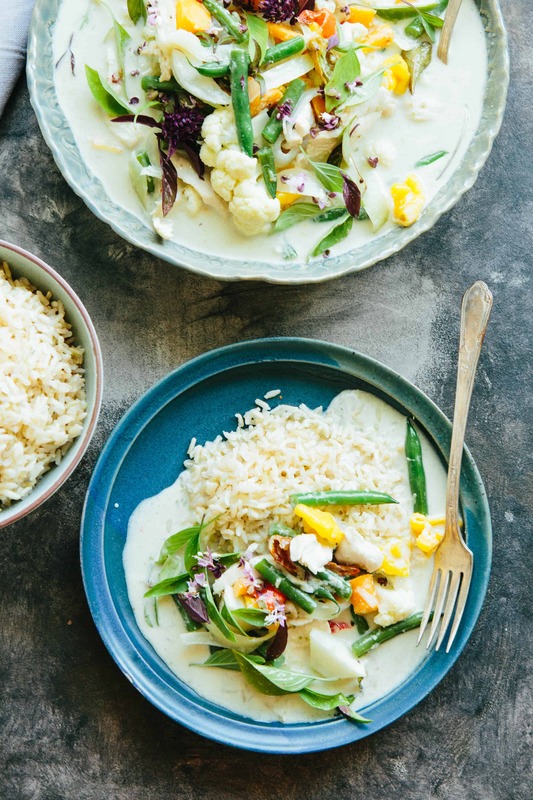 First things first, your Thai green curry is only going to be as good as your Thai green curry paste. This post is really about the importance of using a homemade Thai green curry paste and not one purchased from the store – unless mediocrity is what you’re after. I’ve tried using store bought Thai green curry paste time and time again, using as many different brands as I could find, and I’ve always been super disappointed. I find almost all jarred Thai green curry paste to be boring, lacking depth, and oftentimes oddly flavored. I’m sure there is a decent brand out there somewhere, but I’m less interested in finding it than I am in making it from scratch. That said, if you have a good brand of Thai green curry paste you recommend, I’m all ears. Homemade Thai green curry paste – and other varieties – can be understandably intimidating to make, especially for an Irish-Italian like myself. 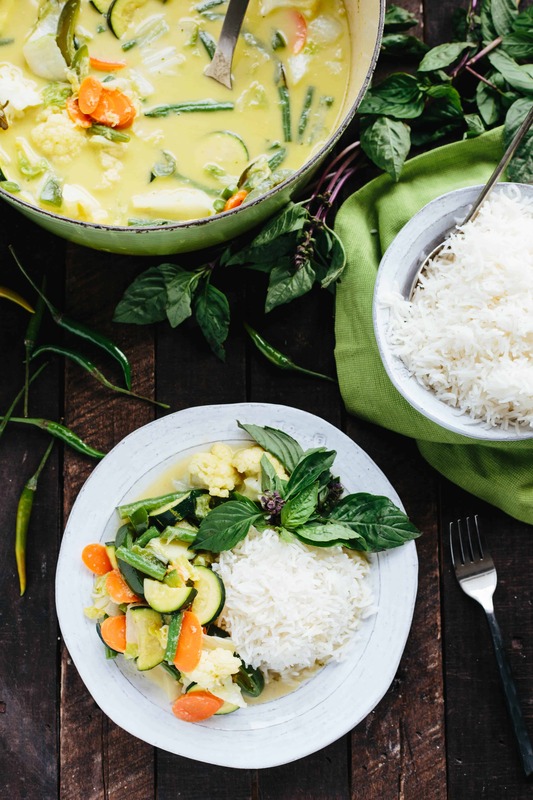 Depending on where you live, some of these ingredients may be hard to find, but they’re absolutely crucial in getting the flavor of your Thai green curry paste just right. I’ll tell you from my experience what you can substitute, what you can leave out, and what you absolutely cannot skip. 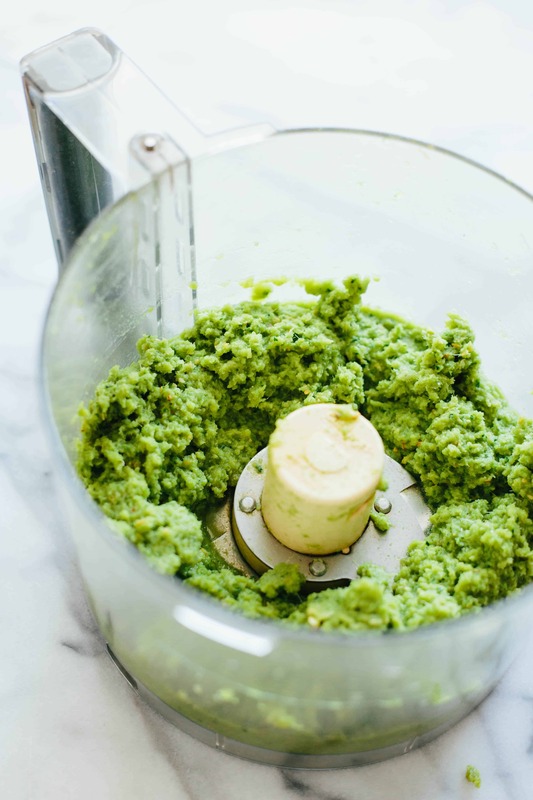 A truly authentic Thai green curry paste will not rely on the convenience of a food processor or blender, but instead, purists will always insist on grinding it down by hand with a mortar and pestle – Thai grandma style. At one point, I became so frustrated with my failed attempts at getting Thai green curry paste right, that I thought this had to be the reason why. So I went for it – I took hours to smash tough, fibrous ingredients down into a paste that still had lots of grit to it. The flavor was delicious, and I wondered if it really was solely because I used this technique, but I had made some other crucial changes that time as well. So I tried the same recipe with a food processor and had just as good, if not better results (at least texturally speaking). Go ahead and take the convenient route to make your Thai green curry paste, unless you’re feeling adventurous, then by all means smash away. The real reason my curries weren’t working out prior to this, as I finally learned, lied in one humble ingredient called galangal. So many recipes for Thai green curry paste I tried either called for ginger or said that you could substitute ginger for galangal, so that’s what I always did. After all, where the f do you buy galangal? What even is galangal? I’ll tell you. Galangal is a spicy aromatic root that’s very similar to ginger, especially in appearance. Finding it fresh has been a challenge for me, but I was eventually able to locate it frozen at my Asian market. It’s totally worth seeking out, because I can tell you with confidence that you absolutely cannot substitute ginger for galangal in Thai green curry paste, unless you want it to taste all wrong. Think of it in the same way you differentiate flat leaf parsley from cilantro. They look incredibly similar and they have a similar texture, but their flavor is very different. Using ginger in Thai green curry paste is basically the equivalent of adding parsley to salsa. It just doesn’t work, and you should run from anyone who tells you otherwise. What differentiates Thai green curry paste from other Thai curries is that it’s made using fresh, obviously green chiles. Small Thai bird chiles are essential for obtaining the right flavor and spice. Yes, I said spice. This Thai green curry paste does have quite a bit of heat to it, and while you can cut it down a bit, if you’re truly opposed to even moderately spicy food then this may not be the recipe for you. Bear in mind that the finished dish will be far less spicy than the Thai green curry paste on it’s own, as it’s a concentration and will be diluted by coconut milk and other ingredients. You can remove the seeds from the bird chiles if you really want, but I don’t think its worth the effort. They’re small and annoying to deal with, and you’re not going to cut out thaaat much heat in the end. I do like to add some serranos (preferred) or jalapeños (if serranos are unavailable) in addition for extra chile flavor and green color, but I do opt to remove their seeds since it’s easier and the seeds are bigger, which can give the Thai green curry paste a grainy texture. Lemongrass and kefir lime are two other very distinct and important flavors. Don’t use that store-bought lemongrass paste, it just won’t do. Use fresh stalks of lemongrass, and use as much of the stalk as you can. Just be sure to peel off the tough outer layers, as they are too fibrous. You only want the tender, inner white and purplish part, otherwise your curry will never become totally smooth. Slice the lemongrass nice and thin before adding to the processor in order to avoid stringiness in your Thai green curry paste. Kefir lime zest is traditional in the paste, but I can only ever find the leaves, so that’s what I use. They have the most incredibly fragrant lime aroma, and I like to add a few of them to the simmering curry as well. Garlic and shallots. Simple enough, but essential. Cumin, coriander, white pepper, and nutmeg make up the dried spices. It’s best to use whole spices and toast them in a pan for a minute prior to grinding, just like in any good curry. But pre-ground spices work fine too. I’ve made it both ways and there isn’t a really discernible difference. Cilantro roots or stems, but never the leaves. I can’t speak to how big of a difference this actually makes, but Chez Pim scoffs at the idea of adding cilantro leaves or any other herbs to Thai green curry paste, and I will blindly follow her advice. She’s been my number one source for learning how to make Thai food, and I’ve never been let down. Her Pad Thai tutorial was an absolute game changer for me. As for topping, however, leave the cilantro in the fridge. Thai basil is the best tasting and most authentic herb for garnishing the finished curry. Italian basil can work in a pinch, but its in your best interest to seek out the Thai stuff. Shrimp paste. 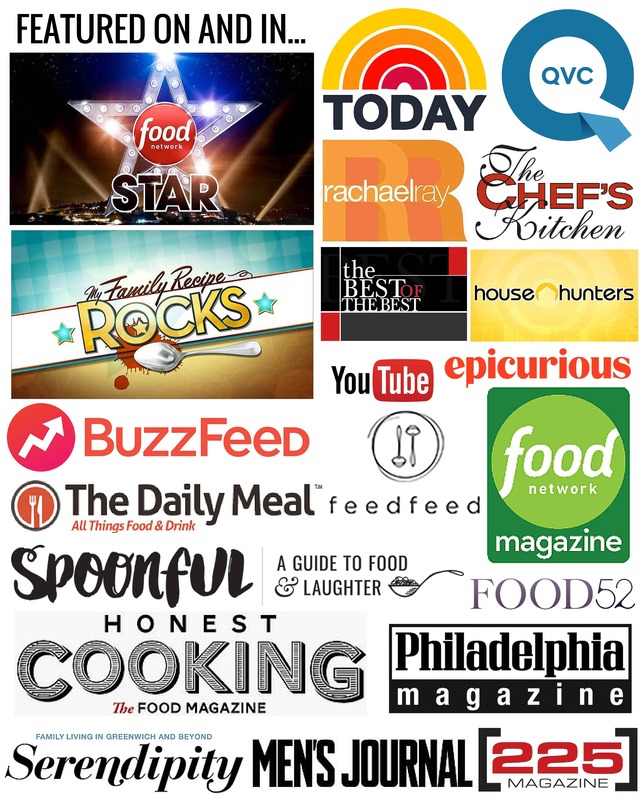 A lot of the more authentic recipes call for it, but I think you can skip it. I’ve used it, but I don’t think it makes enough of a difference to justify seeking it out. I’ve purchased it solely for making Thai green curry paste, which only happens maybe 2-3 times a year, and I always wind up tossing the rest. I no longer bother, and I don’t miss it. 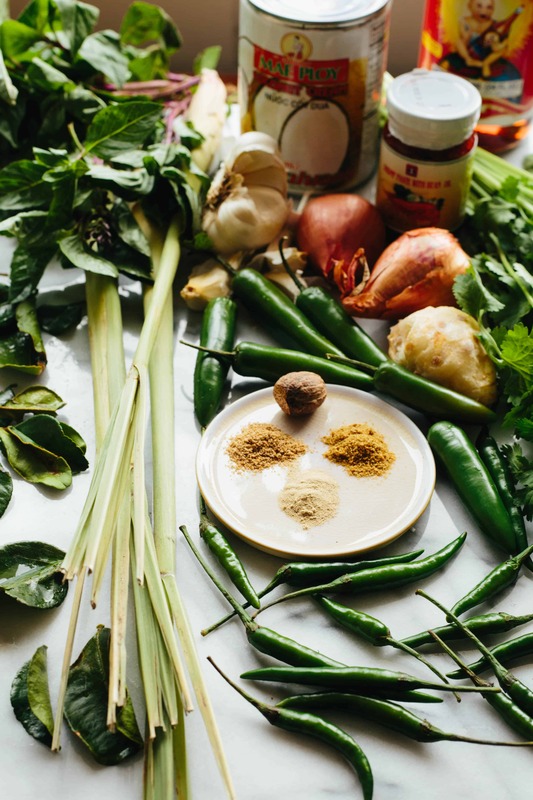 It will take several minutes to process all these ingredients into a fine Thai green curry paste, so be sure you give it enough time. I’ve found that no matter how long I let the processor go, the resulting paste still has a good bit of grit to it. You can press it through a fine mesh strainer if you’re really concerned about the texture, but I actually don’t mind it, and just remind myself about all the extra fiber I’m taking in. Pim says that you can’t freeze Thai green curry paste, but I’m here to tell you that you can and should. This recipe makes enough for about 3 batches of curry, so I froze what I had leftover just to see how it worked, and it worked really well. There was nothing about the frozen Thai green curry paste that I took issue with, so I highly recommend even doubling this recipe and freezing the rest for easy, yet complex weeknight dinners. So that just about covers the Thai green curry paste, now lets talk about making the actual curry. The hard part is done. Woohoo! You can cook just about whatever you want in a curry, but I prefer all vegetables. My favorite combination is onions, carrots, zucchini, green beans, snow peas, napa cabbage, bell pepper, and cauliflower, but you can add whatever veggies you want or want to get rid of. You can also add chicken, shrimp, pork, tofu, or any firm fish like cod or salmon. Once you master the Thai green curry paste and preparing the sauce, even an old shoe would taste pretty damn good in it. Now to assemble the curry. First you want to make sure you fry the Thai green curry paste to cook out the rawness and start developing the flavors. I like to use coconut oil since we’re also adding coconut milk, but any neutral oil is fine. 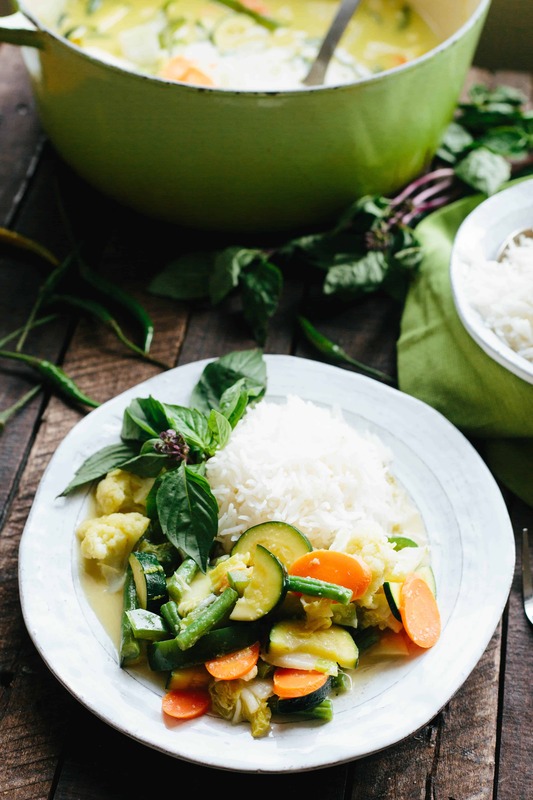 Stir the Thai green curry paste around for several minutes, and then add coconut milk. 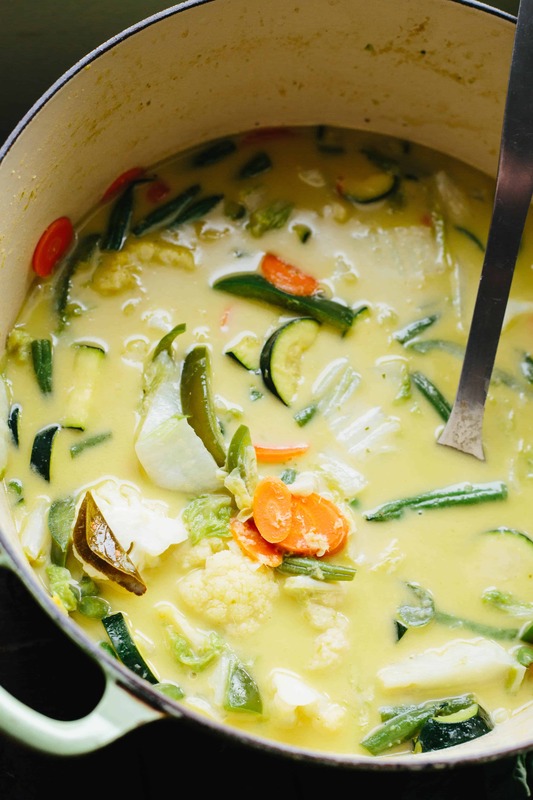 I actually like to use coconut cream, especially when making a vegetable curry since the vegetables release so much of their own liquid and dilute the finished dish. Coconut cream can be a little trickier to find than coconut milk, and either one will really work well. You can also opt to refrigerate your cans of coconut milk, scoop the cream off the top and discard the liquid. It’s also worth mentioning that you do indeed need to use canned coconut milk – the full fat (unsweetened) kind – and not the cartons intended for cereal. Fish sauce is essential for getting that salty, funky component. All fish sauces are not created equal and I am far from being an expert, but I found this article really helpful. I discussed my preferences a little bit in this old post, but I recently bought a bottle of Red Boat, the brand all the chefs swear by, and I have to say it’s definitely worth the hype. It has a really complex, not overly fishy flavor, and is really well balanced. It’s now my new go-to. I recommend doing your research and buying a good brand – it will definitely make a difference in the overall flavor of your curry. We’ve come this far, lets not mess it up now. Palm sugar. It’s definitely the authentic ingredient, but you can absolutely sub in light brown sugar or coconut sugar with fine results. It comes in these little discs that take a few minutes to dissolve, and each one measures out to about a tablespoon. Do this to your taste, but don’t make it sweet. You just want to balance out the other flavors. The best curries are always perfectly balanced. Add your ingredients, simmer until cooked, and really, that’s it! Serve with Jasmine rice – the white stuff obviously tastes the best but if you insist on brown (like in the photo above), that’s fine too. If you made it this far, congratulations! You have to be very determined to read through a thorough and specific post such as this one. I hope you found this tutorial helpful and are planning a trip to the Asian market as we speak. Feel free to comment with any questions or insights I may have missed. This detailed tutorial for authentic Thai Green Curry Paste is spicy and flavorful, plus it freezes well for quick and easy dinners. Makes enough for about 3 large batches of curry. If using whole seeds, add the cumin and coriander to a small saute pan and toast over medium-high heat until fragrant, about 1-2 minutes. Add to the bowl of a food processor or blender and pulverize. If using ground spices, just add them to the food processor and skip the toasting. Add the chiles, shallots, garlic, lemongrass, kaffir lime, galangal, cilantro, nutmeg, white pepper, and salt. Pulverize on high speed until as smooth as possible, stopping every so often to scrape down the sides. If the paste is not blending, add a little bit of water in small increments just to get things moving, especially if using a blender. Depending on your food processor or blender, this will probably take several minutes to achieve. Ingredients like lemongrass and galangal are very fibrous and tough to break down, and it will still have some grit left to it, but try to get it as smooth as possible. Chances are your paste will still have a bit of fibrousness to it. I don’t mind it, but if you find this problematic you can pass it through a fine mesh strainer. Use the paste in curry or as a marinade. Store in the refrigerator for up to 5 days, or freeze in a zip-top bag for longer storage. * I created this recipe using frozen whole pieces of galangal, not fresh, as I don’t have access to any. I imagine it’s flavor is a bit dulled compared to fresh galangal, so if using fresh, you may want to start with less and add more after tasting. By all means, do not substitute with ginger. Heat coconut oil in a large wok or heavy bottomed pot (I use a dutch oven) over medium-high heat. Add curry paste and stir until fragrant, about 2-3 minutes. Add coconut milk or coconut cream and stir, then bring up to a simmer. Add fish sauce, palm sugar, and kefir lime leaves, then simmer for about 5 minutes. Next, add the rest of your ingredients starting with the ones that will take the longest to cook – for me that means onions, carrots and cauliflower. Cook for a few minutes, then add in the quicker cooking vegetables (green beans, snow peas, zucchini, etc.) and protein if using. Simmer until the protein is cooked through and the vegetables are tender, but not cooked to death. Taste the curry and season with more sugar or fish sauce to your taste, then simmer just a little more to even out the flavor if needed. 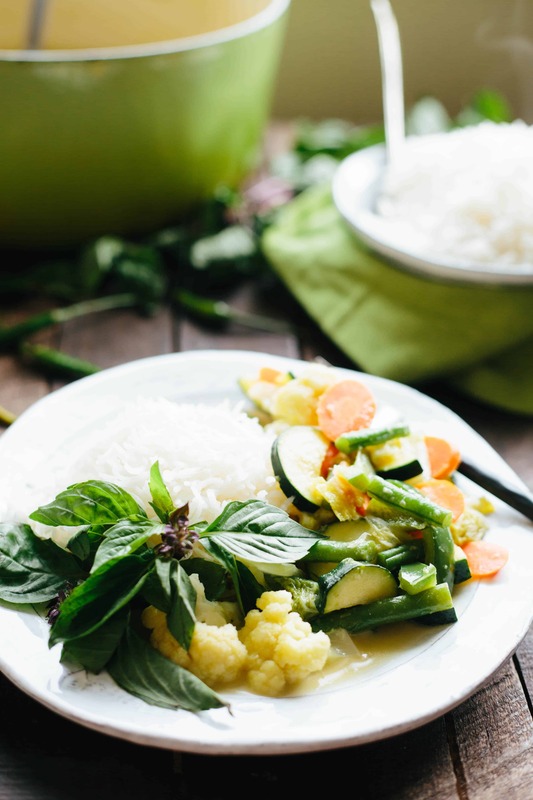 Garnish with big sprigs of Thai basil and serve with Jasmine rice. *The amount of curry paste depends how strong you want it to be. More paste will have a stronger, spicier flavor, and less will be more mellow. **Coconut cream is thicker and creamer and better for an all vegetable curry because they give off a lot of liquid. If you can’t find coconut cream, refrigerate your coconut milk and then scoop the cream off the top and only add some of the liquid, discarding the rest. You’ll want to add an extra can to account for the lost liquid if using this method. ***Different brands of fish sauce will vary greatly in their saltiness and overall flavor. Start with 3 tablespoons and add more as needed to taste. Just know that the flavor will be quite strong at first and will mellow out as the curry cooks. ****The amount of protein and vegetables will vary depending on what you use and how saucy you want the finished dish to be. Experiment with different amounts and combinations to find what you like best. It kills me when people think it’s easy to make green curry- just whisk some paste into coconut milk! I get Thai cooking lessons from my friend Sathima and she makes me WORK. Every ingredient pounded and chopped and cooked just so. I make notes because of course she cooks on the fly. Still an enigma to me, but when I taste it, holy moly. She’d absolutely approve of this recipe. Cilantro roots! Yesss. Awesome post, Nicole. I admire how you worked to get that homemade curry paste recipe just right! This is definitely on my to-cook list.